The transgenic fish contains a foreign DNA sequence that is integrated into its chromosomal DNA. The evidence shown, including several techniques such as microinjection, electroporation, sperm mediated gene transfer, retroviral mediated transfer, and transposable elements were used for production of transgenic individuals. The foreign genes integrate into the fish genome, which then are inherited and expressed by their progeny. Transgenic technique by direct gene manipulation provides a rapid and efficient method for genetic improvement of several fish species (Devlin et al. 2001; Overturf 2009; Warmbrodt et al. 1993). The first report of the generation of transgenic fish in the aquaculture field was in rainbow trout (Onchorhycus mykiss; (Maclean et al. 1992) and goldfish (Zhu et al. 1985). Over the period, a growth hormone gene has been targeted as a transgene aiming to increase the growth rate in more than 20 teleost species. However, after 25 years of accomplishment in the generation of transgenic fish, so far, only one transgenic food fish is marketed in the world along with pet fishes, such as zebrafish (Danio rerio), goldfish (Carassius auratus), and medaka (Oryzias latipes) for basic research. Nowadays, the transgenesis is becoming popular as a powerful experimental tool in the developmental biology of model fish, remarkably in the zebrafish and medaka. Transgenic application for value-addition in ornamental fishes has been more useful than for food fishes in this instance because, transgenesis has long been used as a tool for increasing our understanding of developmental biology by expressing the reporter gene, green fluorescent protein (GFP) or red fluorescent protein (RFP) driven by a tissue-specific promoter (Gibbs and Schmale 2000; Kinoshita et al. 2000; Rembold et al. 2006; Shimizu and Shimizu 2013; Barman et al. 2015). In this comprehensive review, we have discussed the aspects or strategies for developing transgenic fishes is vis-à-vis following ecological, ethical and biosafety issues. Genetic improvement by selective breeding has been a proven technique worldwide, but it is time-consuming. Keeping in view of phenomenal increase in human population and simultaneous decrease in cultivable lands, a selective breeding approach may not be sufficient to mitigate dramatically heightened food demands. The genetic engineering technique of transgenesis could be an alternative approach for commercially viable genetic improvement to meet future food demand. With the vast diversity of fishes, transgenesis could be useful for producing new color varieties of ornamental species and to control reproductive or sexual phenotypes. Over the past four decades, genetic engineering has emerged as the most potential transforming technology. The various transgenic fishes have been developed consisting of transgenic lines expressing growth hormone for aquaculture, industrial, and pharmaceutical applications. Most of the transgenic fishes were developed by using a growth hormone construct because of its importance and highly conserved gene sequence. Those genetically modified fishes depicted dramatic improvement in growth rate, thus showing the useful application of the transgenic in aquaculture (Cressey 2009; Hu et al. 2007; Marris 2010; Thayanithy et al. 2004; Zbikowska 2003). Subsequently, because of biosafety concerns, the auto-transgenic method was used successfully. Besides the growth trait (Du et al. 1992; Hrytsenko et al. 2010; Levesque et al. 2008; Nam et al. 2000); other traits of disease resistance (Dunham 2009; Hsieh et al. 2010; Kim et al. 2013); cold or hypoxia tolerance (Guan et al. 2011; Zhong and Fan 2002) and FCR (Feed conversion ratio) improvement (Krasnov et al. 1999) were also considered for transgenesis. The first transgenic food fish was produced as “AquAdvantage Salmon” with augmented growth rate and size compared to wild type (Clifford 2014). AquAdvantage™ Atlantic salmon (Salmo salar; Aqua Bounty Technologies Inc.,Waltham, Massachusetts, United States), a growth-enhanced food fish, approved by the US Food and Drug Administration (FDA) and marketed. We have depicted the current developed transgenic fishes in Table 1, using latest evidence. Table 1: Transgenic food and ornamental fishes developed so far. The genes of interest in transgenic fish production are growth hormone genes, metallothionein, crystalline, antifreeze protein, esterase, and regulatory gene sequences (Davies et al. 1989; Gong and Hew 1995; Gong et al. 2003; Yazawa et al. 2005). For example, metallothionein gene promoter, heat shock gene promoter, and other tissue-specific promoter like myosin light polypeptide chain (mylz) and keratin (Asaduzzaman et al. 2013; Iwai et al. 2009). The GFP transgenic Medaka line has been produced for monitoring a wide-ranging endocrine disrupters (estrogenic) with a promoter derived from the vitellogenin (vtg) gene (Zeng et al. 2005b). It has been shown, tumors also can be generated via transgenic expression of oncogenes in zebrafish (Langenau et al. 2003). The metallathionin promoter an inducible promoter has been characterized from several fishes, which are used for binding heavy metals in cells with cadmium, copper, zinc, and mercury (Lin et al. 2004; Mao et al. 2012; Ren et al. 2006). The evidence depicted that transgenic common carp contacting growth hormone transgene is less tolerant of un-ionized ammonia, which is an important stress indicator in aquaculture (Guan et al. 2011). In addition, tissue-specific promoters and inducible promoters, such as heat shock protein 70 (HSP70) of Zebrafish, has been used for controlling expressing transgenes in the preferred tissues under the desired conditions (Halloran et al. 2000). Apart from food fishes, ornamental transgenic fishes have been developed using different color genes. The stable lines of transgenic zebrafishes expressing several living color proteins, such as GFP, RFP, YFP, BFP and CYP were successfully generated (Gong et al. 2003). As of now, zebrafish and medaka were model fish species in many of laboratories because they reproduce with external fertilization, have a short life span and produce transparent eggs. The possibility of the stable expression of color genes was analyzed by zygotic injection of expressible constructs driven by the zebrafish muscle-specific promoter of the myosin light polypeptide 2 (mylz2) gene (Ju et al. 2003). The zebrafish (D. rerio) mylz2 promoter has also been used successfully to generate fluorescent white skirt tetra (Gymnocorymbus ternetzi), medaka (O. latipes) and farmed rohu carp, Labeo rohita (Mohanta et al. 2014; Pan et al. 2008; Zeng et al. 2005a). The GFP color can be visualized only under a fluorescent microscope for mylz: GFP transgenic rohu (Mohanta et al. 2014). The value-added aquarium fishes have already been commercialized, such as ‘GloFish’ with six attractive fluorescent color combinations, including Starfire red, cosmic blue, electric green, galactic purple, sunburst orange and moonrise pink (Knight 2003; Vick et al. 2012) (www.glofish. com). Techniques such as the direct microinjection, electroporation, retrovirus infection, transposable elements, and particle gun bombardment have been utilized to introduce external genetic material (DNA) into vertebrate cells (Chen and Powers 1990; Liu et al. 1990; Rembold et al. 2006; Ye et al. 2011). Among those methods, microinjection and electroporation have proven to be the most reliable techniques of gene transfer in fishes (Barman et al. 2015; Hostetler et al. 2003). Efficiency of gene transfer is determined by several factors including: hatching percentage, gene integration frequency, quantity of eggs manipulated in a given amount of time and effort required to manipulate the embryos. In this method, foreign DNA has been injected into fertilized eggs. The first evidence was reported in goldfish, where foreign DNA microinjected into the fertilized eggs (Nam et al. 2001; Zhu et al. 1985). This method has also been adopted in a wide range of fishes, including goldfish, common carp, atlantic salmon, catfish, medaka, tilapia, rainbow trout, and zebrafish (Dunham et al. 1992; Hew et al. 1992; Ozato et al. 1986; Rosen et al. 2009; Xu et al. 2008; Zhang et al. 1990; Zhang and Yang 2004). The earlier studies depicted the survival rate of microinjected fish embryos ranging from 35% - 80%, which was species dependent and expertise. The rate of integration of DNA ranges from 10% - 70% reported in the fishes (Powers et al. 1991). The difficulties of microinjection include the tough and opaque chorion, which hinders insertion of glass micropipettes, although this has been solved by making a hole in salmonids and injection into oocyte nuclei, which is two-step injection. Dechorionation of eggs were also attempted manually as well as trypsinization and pronase treatment. Thus, this microinjection technique in fish eggs is complicated, slow, tedious, time-consuming, requires a great deal of skills and relatively expensive equipments, and unsuitable for mass gene transfer. Also microinjection causes mechanical damage to the fertilized eggs. All these issues prevented rapid progress in transgenic research in fish. Electroporation was accomplished by subjecting cell membranes to a high-voltage electric field, resulting in a shortterm breakdown and forming pores that were large enough to allow macromolecules to enter or leave the cells. Electroporation was simple, operator-independent, a rapid, potential mass method and avoided the difficulties accompanying microinjection. Electroporation was a successful technique for transferring foreign DNA into the genome of fishes (Inoue et al. 1989; Inoue et al. 1990; Murakami et al. 1994). The study showed that electroporation could be more efficient than microinjection with higher integration rates (Rembold et al. 2006). The study depicted that the rate of DNA integration in electroporated embryos was more than of 20%. This was the popular method for introducing foreign DNA into fertilized eggs and or embryos of fish (Rao et al. 2008). This was further supported in medaka and remarked higher number of transmitting ability produced by electroporation (Hostetler et al. 2003). The efficiency of the electroporation reduced because of voltage, number and frequency of pulses. The earlier study revealed that this was the successful transfer of transgenes into fish by electroporating sperm. The electroporation was, therefore, considered an efficient and versatile gene transfer technology. The electroporation method accompanied by sperm has been used in laboratories for improving transgenic efficiency (Liu et al. 2011). The sperm electroporation technique was standardized to ensure 25% hatching survival and 37%, presumptive transgenic (Hu et al. 2000; Sin et al. 2000). In this method, sperm was used for delivering the foreign DNA or gene to the unfertilized eggs or oocyte during fertilization. In this method, DNA was incubated with the sperm, followed by in vitro fertilization, so as to hasten transfer of DNA. Recently, the method of electroporated rohu carp (Labeo rohita) sperm was successfully used to produce transgenic rohu (Barman et al. 2015). This method is now being realized as a valuable technique for transgenic animal or fish production. Although transgenic techniques have been adopted successfully by microinjection and electroporation techniques with great efficiency, mosaicism is the major concern in resulting individuals. Therefore, a retroviral vector, such as long terminal repeat (LTR) sequences of Moloney murine leukemia virus (MoMLV) and pantropic retroviral vector, has been developed for improving efficiency of integration of the gene (Core et al. 2012; Gill et al. 2010). Because of its higher efficiency, it has been used to produce transgenic organisms, including fishes. Regrettably, these viral vectors are inclined to unstable expression or even complete silencing of transgene expression and integration rates may be increased because of active infection. The successfully used retroviral vector or constructs reported to produce transgenic crayfish and top minnows, Poeciliposis lucida (Sarmasik et al. 2001a; Sarmasik et al. 2001b). In a recent study, pantropic retroviral vector has been used as a tool for transducing sea urchin embryos (Core et al. 2012). This is a valuable gene transfer technique for fishes, in general, but, introduction of viral sequences into food fish may not be accepted by the public (biosafety, ethical issues), but it could be used for ornamental fish development. The transposable elements, such as Tol2, has been useful for transgenesis in most fishes, including zebrafish, medaka and tilapia (Fujimura and Kocher 2011; Ivics et al. 2009; Kawakami 2007). The transposable elements, such as Tol2, originally discovered in the genome of the Japanese medaka fish (Koga et al. 1996) has the capacity to integrate in the genome by catalyzing transposition by transposase enzymes. Evidence showed the germline transmission frequency of Tol2 transposable elements was more compared to other techniques. The major problem in transgenic fish production was the failure of ubiquitous expression, leading to mosaicism, most likely because of the faster rate of differentiation compared to laboratory or farmed animals. This was the result of the delayed integration at the one-cell stage, random integration of the transgene into host DNA, degradation of foreign DNA by host enzymes, endto- end ligation of the injected DNA before integration, inability of inheritance of foreign DNA (Hu and Zhu 2010; Moreau et al. 2014; Wu et al. 2005; Wu and Zhu 2003). The transgenes could integrate at single or multiple chromosomal locations. For salmonids, the frequency of transgene integration was 15%, at the 2-4 cell stage of development (Devlin et al. 2001). Thus, stable integration of the transgenes was a prerequisite for continuous vertical transmission to succeeding generations and establishment of the transgenic fish cell-line. Despite that integration efficiency of transgene was a random process, to identify stable integration of transgenes, few methods were adopted, such as the use of reporter genes, such as CAT, LUC, LacZ, GFP and RFP. The transponsable elements (sleeping beauty) are also being used for transgenesis to improve integration efficiency (Ivics et al. 2009). Although, the transgenic fish technology has been proven to be feasible across global laboratories, few controversial issues remain unanswered. Gathered evidence revealed growth hormone transgene effects on growth performance wre inconsistent among offspring gained from different homozygous transgenic common carp (Xu et al. 2011; Zhong et al. 2013). Several transgenic food fishes have been developed, but it is not commercialized (except AquAdvantage salmon) because of social issues and its associated ecological issues. Therefore, understanding the use of transgenic fishes with major risks to human health and biodiversity need to be understood (Britton and Gozlan 2013; Fu et al. 2005; Muir and Howard 2002; Ramseyer 2002; Weaver 2002). The recent study depicted the food intake of transgenic common carp has increased, containing GH, which was mediated by up-regulating Agouti-related protein (AgRP) (Zhong et al. 2013). Recently, one study reported the reproductive performance of GH-transgenic of male Atlantic salmon to be lower compared to its wild counterpart (Moreau et al. 2011). Use of viral vector during production of transgenic fishes might endanger human health. The ecological concerns about the use of transgenic fish are the loss of genetic diversity and biodiversity. Because, the innate ability of fish to escape confinement and potentially invade wild or native ecosystems raises the ecological concerns associated with their transgenic production (Duan et al. 2009; Stokstad 2002; Muir and Howard 2002). It is believed generally that fertility and viability are the key fitness features for evaluating the ecological safety of transgenic fish (Sundstrom et al. 2004). Evidence showed that transgenic fish exhibited many changes in behavior and phenotypes, such as feeding motivation, migration, dispersal, predation, and spawning ability (Martinez et al. 2000; Moreau et al. 2011; Moreau et al. 2014). The ecological risks of releasing transgenic fish into the aquatic environment could be abridged by making them sterile (Su et al. 2015). Sterility may be succeeded by ploidy manipulation or hormonal treatment. Because, sterile transgenic fish pose no risk of any genetic effects on the local gene pool. If they are fertile and escaped, they could breed with wild stocks of the same species, leading to the spread of the transgene in the natural populations (Duan et al. 2009; Muir and Howard 2002; Weaver 2002). There is no clear-cut evidence about interactive effect of transgenic fishes on the wild fish populations. The risks, as well as benefits, of transgenic fish are not certain. Based on mathematical modeling, a Trojan Gene Effect theory was proposed using male transgenic medaka expressing salmon growth hormone gene (Howard et al. 2004). Implementation of an effective containment (confined rearing) strategy could be one of the important ways to overcome the ecological risks. The formulation given by the FDA should be followed for each form of biological, mechanical, chemical, and geographical confinement and for the overall combination of confinement methods (Hu et al. 2007). Biological confinement could be done using making 100% all-female or male populations or sterile fish (Xu et al. 2013). Other confinements, such as mechanical, chemical, and geographical could be employed by using separate facilities for transgenic fishes to avoid ecological risk. The transgenic triploids were successfully produced by crossing transgenic diploid common carp with tetraploids (Zhu et al. 1985). The evidence showed ‘AquAdvantage’ salmon would be sterile, which reduce environmental risks by avoiding breeding with wild fish, having dominate feed gaining capacity (Devlin et al. 2006). Faster growing transgenic fishes generally showed lower juvenile viability (Muir and Howard 2002). It has been shown that transgenic common carp do not have the ability to produce their own populations (Lian et al. 2013). Several methods have been reviewed for assessing environmental risks of transgenic fish (Hu et al. 2007; Kapuscinski 2005). These methods thoroughly integrate information about the environment and transgenic fish genotypes or phenotypes, to identify and set priority risks on which to focus environmental risk assessment (Crossin et al. 2015; Devlin et al. 2006; Hu et al. 2007; Kapuscinski 2005). However, it is not easy to achieve 100% sterility by pressure-shock induction of triploids. It is obvious the triploid approach is not proper for all species of genetically modified fish, and more probable techniques need to be developed to ensure environmental safety of transgenic fish. The phenotypic effects of these sterilization methods could be confounded with effects of the introduced gene, thus making it difficult to evaluate the performance effects of transgenes. The physical and chemical confinement measures failed because of equipment or power failures, operational wear, and human errors. The failure in analysis of geographical confinement may include data on how ‘AquAdvantage’ salmon respond to changes in temperature and season (Lohmus et al. 2008). During risk assessment, biological complexities including gene-environment interactions, ecological variability, background genetic effects, pleiotropic effects, traits expressed across different life stages, evolution of fertile transgenic fish after escape, and poorly understood ecological processes were major hurdles (Sundstrom et al. 2010). The environmental conditions can affect the phenotypic difference between transgenic and wild fishes. The earlier study explained that those effects may occur on non-transgenic fish in populations because of the presence of the transgene and, thus, required a needful strategy for risk assessment (Li et al. 2009; Lohmus et al. 2010; Lohmus et al. 2008; Raven et al. 2012; Sundstrom et al. 2005; Sundstrom et al. 2010; Sundstrom et al. 2004; Wu et al. 2004). The recent study depicted the comparative analysis of the structure of an offspring population of ‘‘all-fish’’ growth hormone gene-transgenic common carp with wild to evaluate their fertility and juvenile viability. It showed nearly identical mating competitiveness while, also, transgenic carp were unlikely to form dominant populations in natural aquatic environments because of their low juvenile viability (Lian et al. 2013). Advances of gene editing technology: Inactivation of a gene can be accomplished by applying a gene knockout strategy or incorporating a mutated copy of the gene. The gene integration at a predetermined position mediated by the cre - recombinase with mutant lox sites successfully carried in the transgenic zebrafish (Gong et al. 2003). Recent advances in gene editing technologies, such as zinc finger nuclease (ZFN), transcriptional activatorlike effector nucleases (TALENs) and CRISPR (clustered regulatory interspaced short palindromic repeats)/CRISPRassociated nucleases (Cong et al. 2013; Mali et al. 2013; Miller et al. 2007; Sanjana et al. 2012) in combination with homologous recombination mediated transgene introduction at a predefined location of the genome (Hockemeyer et al. 2009; Sanematsu et al. 2006). It has been possible to undertake development of model animals, including zebrafish, to knock-in or –out a particular gene of interest (Liu et al. 2007). The site-specific nick by nucleases can then be repaired by error-prone nonhomologous end joining (NHEJ) resulting in animals carrying deletions or insertions at the cut site and disruption of any gene of interest can be made by enforcing homologous recombination mediated repair at a specific nick site. Along with that, CRISPR systems (Streptococcus pyogenes) has been well characterized, which includes an endonuclease Cas9, a CRISPR RNA (crRNA) and a transacting RNA (tracrRNA). It can be programmed to introduce site-specific DNA double strand breaks by providing a single guide RNA that is gRNA chimera containing fusion between crRNA and tracrRNA (Gaj et al. 2013). The previous studies in fishes revealed heritable targeted gene disruption in zebrafish, using designed zinc-finger nucleases (ZFN), resulting in the desired effect (Doyon et al. 2008; Meng et al. 2008). The knock-out of duplicated copies of myostatin gene (mstna) in yellow catfish, using zinc finger nucleases (ZFN) and TALEN, carried out the first endogenous geneknockout in farmed fish (Dong et al. 2011). Those investigations encouraged the exploration of creating a Cas9/gRNA-based gene mutation or modification platform for large bodied farmed carps. The study showed mice carrying a targeted dominant mutation in MSTN gene, which suggested an increase in skeletal muscle mass as a result the combined effect of muscle hypertrophy and hyperplasia (Chen et al. 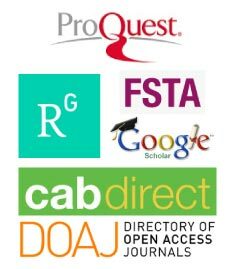 2010; Pai et al. 2002). Afterwards, skeletal muscle growth because of mutation in the MSTN gene was reported in dogs, cattle, buffalo, porcine and sheep (Boman et al. 2010; Chen et al. 2010; Hu et al. 2013; Mosher et al. 2007; Stinckens et al. 2008). Thus, to improve skeletal muscle mass for increasing production, a major area of scientiÃ¯Â¬Âc research in the animals has opened. Whereas, in a fishes, the MSTN gene is well conserved throughout evolution, two distinct MSTN genes were found in some fish species (Biga et al. 2005; Kerr et al. 2005; Nadjar-Boger et al. 2012; Pie and Alvares 2006). To investigate the myostatin role in fish muscle development and growth, a transgenic approach was used to express Myostatin pro-domain in zebrafish muscle cells, thus, researchers speculated that MSTN function was inhibited (Meyer et al. 2013; Zimmers et al. 2002). Recently, MSTN gene characterization as well as knock-out were carried out in other fish species, such as yellow catfish (Dong et al. 2011), medaka (Chisada et al. 2011), rainbow trout (Phelps et al. 2013), lobster (MacLea et al. 2012), chinese scallop (Hu et al. 2010), yellow catfish (Dong et al. 2011) and bay scallop (Guo et al. 2012). Researcher has noted MSTN expressed in the liver and intestine of channel catfish (Ictalurus punctatus) (Kocabas et al. 2002). Thus, diverse tissue distribution of the MSTN gene suggested its functional variations in different species. Thus, isolation and analysis of MSTN genes from different species helped in the understanding of its specific role in certain species. Thus, it is likely that applications of gene-editing and gene-integration technologies, such as TALEN and CRISPR associated nucleases have the potential to incorporate indels (by NHEJ repair) at desired location(s) of the fish myostatin gene. As shown in Figure 1, we have depicted a strategy for generations of transgenic fishes using gene editing techniques. This could lead to loss of gene function. Alternatively, the gene of interest could be knocked-out by enforcing HR mediated repair of nick created by TALENs or CRISPR/Cas9 nucleases. 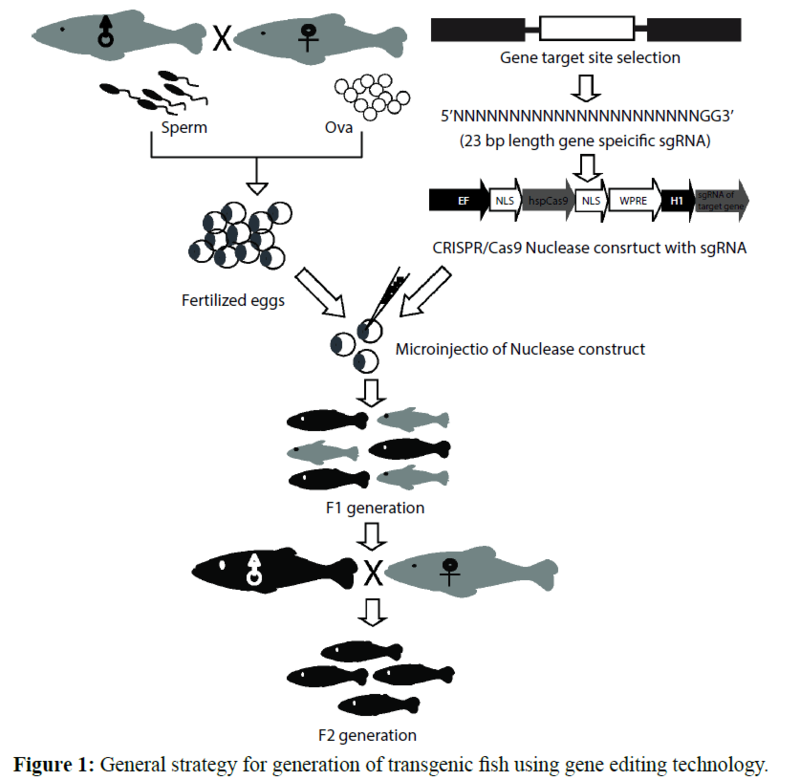 Figure 1: General strategy for generation of transgenic fish using gene editing technology. The development of Glofish sets a model for developing newer color varieties in ornamental fishes. This is the only ornamental fluorescent zebrafish (Danio rerio; Yorktown Technologies, Austin) were reached in the US market. Several genes, such as green fluorescent protein (GFP), luciferase, bacterial chloramphenicol acetyltransferase (CAT), neomycin phosphotransferase II (neor), and β -galactosidase (β-gal) are commonly used to produce a DNA construct with reporters (Gibbs and Schmale 2000; Gong et al. 2001). Attempts have been reported to produce novel varieties of ornamental fish for rearing as pet, and to use the change of body color as reporters for detecting environmental changes as biosensor (Lee et al. 2015). The U.S. Food and Drug Administration (FDA) determined there is no evidence that these genetically engineered zebrafish pose any greater threat to the environment than their widely sold unmodified counterparts. The reporter genes such as green fluorescence protein (GFP) and several GFP variants driven tissue specific promoters, such as skin specific keratin gene (krt8) and muscle-specific gene (mylz2) are the genes used most (Gong et al. 2003). The GFP, extracted from jellyfish (Aequorea victoria) has become convenient markers for transgenic fish because of their sensitive signal detection (Gibbs and Schmale 2000; Gong et al. 2001). With this, red fluorescence protein (RFP) reporters can be detected easily in the live transgenic fish, such as zebrafish and medaka (Zeng et al. 2005a). The melanin concentrating hormone (MCH) was used to generate colored transgenic medaka, which was isolated from chum salmon (Berman et al. 2009). Till now, several colorful transgenic zebrafish displaying whole-body green, red, yellow or orange fluorescent colors was generated successfully (Gong et al. 2003). The mutant zebrafish and medaka with less interfering pigmentation for optical observation also have been developed (Dai et al. 2010). The GFP-tagged transgenic embryos, as well as fish, have become the most convenient and widely used tools in basic biological research, particularly to regulate gene expression, morphogenetic movements of cells and organogenesis during embryonic development (Asaduzzaman et al. 2013; Shimizu and Shimizu 2013; Xu et al. 2011). From the 1990s, the greater number of fish genes have been characterized by encoding the growth hormone. The cloning of β-actin promoter from carp has allowed the production of an all-fish construct by means of expression vectors for use in transgenic fish (Liu et al. 1990). The use of an ‘auto transgene’ construct, where the promoter or regulatory element and targeted gene derived from the same species, was shown to be helpful in transgenesis. Studies were conducted in fish, using mammalian and avian promoters, also, sometimes, viral promoters. This requires isolation of a species-specific functional promoter capable of driving either ubiquitous or tissue-specific expression of the gene of interest. The β-actin promoter showed variable but, sometimes, ubiquitous transient expression in medaka (Cho et al. 2011). At CIFA, studies were carried out on characterization of rohu β-actin gene and promoter, which was an evolutionary conserved sequence. Its promoter could be used for ubiquitous expression of genes of interest (Barman et al. 2010; Barman et al. 2015). The entire rohu β-actin promoter/ regulatory region showed closest similarity to that of catla (Catla catla), among the sequences of other species available in GenBank. The potential implications in the basic research, vaccination, gene therapy and transgenics have been demonstrated by Barman et al. 2010. In this way, the use of an endogenous promoter constructs, where the promoter-regulatory element is derived from the same species, was shown to be useful in driving the foreign gene expression (Hall et al. 2007; Her et al. 2004; Kinoshita et al. 2000; Nam et al. 2001; Rembold et al. 2006). Studies by fisheries research institutes (CIFA) depicted that the isolation of the rohu (L. rohita) mylz2 promoter will have potential use in tissue-specific, desired expression of genes of interests for generating transgenic rohu. The 5’-flanking region (1.2 kb) of a muscle-specific gene myosin light chain 2 polypeptide (mylz2) of rohu carp, was cloned successfully (Mohanta et al. 2014). Direct muscular (skeletal) injection of the construct containing the mylz2 promoter (0.6 kb) linked with GFP reporter gene marked efficient expression in L. rohita, confirming its functional activity, which was confirmed by observation and promoter drove GFP expression in the skeletal muscle of transgenic rohu (Barman et al. 2015). The β-actin promoter may have prospective applications for value-addition in ornamental fishes as well as understanding gene regulatory network or functions. The study revealed direct muscular injection of the construct containing β-actin promoter fused to a GFP reporter gene showed efficient expression at the site of injection as well as in the areas away from the site. About 20% of transgenic offspring showed ubiquitous expression of the reporter GFP gene and massive epithelial and/or muscular expressions, with visible green color under normal light, were documented in a few transgenic rohu (Barman et al. 2010; Barman et al. 2015). Now, researchers are concerned about doing research on transgenic fishes because of the safety of such work, which led to the optimizing guidelines for safe laboratory practices (Rahman et al. 1998). The researchers or scientists are alert to assessing the Biosafety of genetically modified fish. The World Health Organization (WHO) and the Food and Agriculture Organization (FDA) have given complete international guidelines for recommendations and the safety assessment of foods derived from biotechnology, as well as safety evaluation of all genetically modified organisms. The detail policies and approval process required for transgenic fishes has been reviewed and discussed several times. The National Institute of Health (NIH) and FDA framed different and often-revised guidelines for research, production and commercial use of transgenic organisms. Until now, twelve countries have framed their respective national policies for regulation of transgenic aquatic organisms. Out of twelve countries, only six countries have developed field-testing of transgenic fish (China, Israel, Hungary, New Zealand, UK and USA), comprising transgenic carp, salmon, nile tilapia and channel catfish (Fu et al. 2005). The Cartagena protocol (SCBD, 2000) has a detailed treatment of risk assessment towards protecting biological diversity from transgenic organisms. Regulatory approval of the first transgenic fish for human consumption is being considered by the U.S. and Canadian governments. Screening methods, such as southern blotting and transcription analysis, can be done using Northern blotting, ribonuclease protection assays and RT-PCR for transgenic fishes. Finally, characterization should be performed using protein product and its expression, which can be correlated with any phenotype of the fishes using techniques, including Western blotting, enzyme-linked immunosorbent tests (ELISA), radio-immunoassay and immune-histochemistry. The production of transgenic food fish is promising, with techniques to meet the future food demand. But it has been held up because of regulatory issues. In this field, it is necessary to isolate and identify novel, useful genes and suitable promoters of fishorigin, which are helpful for expression of the transgene in a tissue at the desired level. Advance techniques, such as gene editing technology, could be applied to resolve transgenic efficiency issues. Continuous monitoring of integration of the transgene in further generation is needed. Biosafety issues of transgenic fishes also need careful consideration. For framing or updating regulations affecting GMOs, accurate and current information must be used. Therefore, the challenge is great in developing GM food with no adverse effects on every single individual in the human population. Thus, accurate information about the transgenic must be spread among the general population. Producing the knock-out or -in gene inactivated transgenic fish may be more acceptable to people, who are worried about the safety of the foreign genes introduced into the fish genome. In case of ornamental fish, it is possible to use transgenic techniques for developing new varieties with novel or brilliant colors or shapes. Glofish produced in Singapore and marketed in the USA, highlighted the new possibilities for producing new multicolored fluorescent fish, having economic benefits. The color genes, such as green (GFP), red (RFP), blue (BFP), yellow/golden (YFP) and cyan (CFP), provided avenues for value-addition to small aquarium fishes other than zebrafish and medaka. Because of the global demand for food, transgenic fishes are useful for improvement of fish production, food security and strengthening livelihood. Establishment of a sterile, transgenic population could be used for avoiding contamination of natural gene pool. The auto-transgenic fish should be produced following the principles of the Cartagena Protocols and bio-safety rules. Knowledge of the effect of transgenic fishes and their integration needs to be studied further. The risks attached to the use of GMOs must be analyzed and quantified in more sensible and trustworthy ways. Aquaculture should adopt sterile transgenic fish for reducing the biodiversity risk. Therefore, after using the transgenic method to achieve growth, we should combine selection methods with marker-assisted breeding to develop transgenic lines with the desired performance traits. Also, it is important that fisheries scientists be involved in evaluation of the performance and ecological effects, as well as forming public policies regarding the development and release of transgenic fishes. Escaped transgenic fish will not result in deleterious effects on native populations, hence, careful risk assessment is required to determine the ecological risks. The gene inactivation approach, using gene editing techniques, would be valuable in producing transgenic fish, specifically with economically important aquaculture species, with more flesh and a higher FCR (food conversion rate). In contrast, the transgenic technology has been widely used in developmental biology. In the past few years, we have also made efforts to apply the transgenic methods into other niche areas, such as ornamental fish, environmental monitoring and bioreactors. The potential of transgenic fishes as novel color varieties as well as bioreactors could be developed using these technologies, inasmuc as FDA declared no issue about pet fish. The transgenic fish production can be used for producing new ornamental fishes and making biosensor to monitor water pollution levels, which will be less controversial. Although this technology has been used successfully to create ornamental transgenic fish species, further research is needed to harness the available resources. Our review will be helpful for researchers undertaking transgenic research for the development of food and ornamental fishes using advanced gene editing techniques. Conceived, outlined and designed by HKB, KDR and JKS. Literature suveryed and written by KDR, VC, SKP and HKB. Critically revised the manuscript for important intellectual content by ASN and PJ. All authors read and approved the final manuscript. The authors are thankful to the Indian Council of Agricultural Research, Ministry of Agriculture and Farmers Welfare, Government of India for supporting this work. Anathy, V., Venugopal, T., Koteeswaran, R., Pandian, T.JMathavan, S. (2001) Cloning, sequencing and expression of cDNA encoding growth hormone from Indian catfish (Heteropneustesfossilis). Journal of biosciences 26, 315-24. Asaduzzaman, M., Kinoshita, S., Bhuiyan, S.S, Asakawa, S., Watabe, S. (2013)Stimulatory and inhibitory mechanisms of slow muscle-specific myosin heavy chain gene expression in fish: transient and transgenic analysis of torafuguMYH(M86-2) promoter in zebrafish embryos. Experimental cell research 319, 820-837. Barman, H.K., Das, V., Mohanta, R., Mohapatra, C., Panda, R.P., Jayasankar, P. (2010)Expression analysis of β -actin promoter of rohu (Labeorohita) by direct injection into muscle.Current Science 99. Barman, H.K., Mohanta, R., Patra, S.K., Chakrapani, V., Panda, R.P. et al (2015)The β-actin gene promoter of rohu carp (Labeorohita) drives reporter gene expressions in transgenic rohu and various cell lines, including spermatogonial stem cells. Cellular and Molecular Biology Letters 10. Berman, J.R., Skariah, G., Maro, G.S., Mignot, E.,Mourrain, P. (2009)Characterization of two melanin-concentrating hormone genes in zebrafish reveals evolutionary and physiological links with the mammalian MCH system. The Journal of comparative neurology 517, 695-710. Biga, P.R., Roberts, S.B., Iliev, D.B., Mccauley, L.A., Moon, J.S. et al. (2005)The isolation, characterization, and expression of a novel GDF11 gene and a second myostatin form in zebrafish, Daniorerio. Comparative biochemistry and physiology Part B, Biochemistry and molecular biology, 141, 218-230. Boman, I.A., Klemetsdal, G., Nafstad, O., Blichfeldt, T.Vage., D.I. (2010)Impact of two myostatin (MSTN) mutations on weight gain and lamb carcass classification in Norwegian White Sheep (Ovisaries). Genetics, selection, evolution : GSE 42, 4. Britton, J.R., Gozlan, R.E. (2013) Transgenic fish: European concerns over GM salmon. Nature 498, 171. Chen, T.T.,Powers, D.A. (1990)Transgenic fish. Trends in biotechnology 8, 209-215. Chen, T.T., Vrolijk, N.H., Lu, J.K., Lin, C.M., Reimschuessel, R. (1996)Transgenic fish and its application in basic and applied research. Biotechnology annual review 2, 205-236. Chen, Y., Ye, J., Cao, L., Zhang, Y., Xia, W. (2010)Myostatin regulates glucose metabolism via the AMP-activated protein kinase pathway in skeletal muscle cells. The international journal of biochemistry & cell biology 42, 2072-2081. Chisada, S., Okamoto, H., Taniguchi, Y., Kimori, Y., Toyoda, A. et al (2011)Myostatin-deficient medaka exhibit a double-muscling phenotype with hyperplasia and hypertrophy, which occur sequentially during post-hatch development. Developmental biology 359, 82-94. Cho, Y.S., Lee, S.Y., Kim, Y.K., Kim, D.S.,Nam, Y.K. (2011)Functional ability of cytoskeletal β-actin regulator to drive constitutive and ubiquitous expression of a fluorescent reporter throughout the life cycle of transgenic marine medakaOryziasdancena. Transgenic research 20, 1333-1355. Clifford, H. (2014)AquAdvantage Salmon - a pioneering application of biotechnology in aquaculture. BMC Proceedings8. Cong, L., Ran, F.A., Cox, D., Lin, S., Barretto, R. (2013)Multiplex genome engineering using CRISPR/Cas systems. Science339, 819-823. Core, A.B., Reyna, A.E., Conaway, E.A., Bradham, C.A. (2012)Pantropic retroviruses as a transduction tool for sea urchin embryos. Proceedings of the National Academy of Sciences of the United States of America 109, 5334-5339. Cressey, D. (2009)Aquaculture: Future fish. Nature458,398-400. Crossin, G.T., Sundstrom, L.F., Vandersteen, W.E.,Devlin, R.H. (2015)Early life-history consequences of growth-hormone transgenesis in rainbow trout reared in stream ecosystem mesocosms. PloS one10, e0120173. Dai, J., Cui, X., Zhu, Z.,Hu, W. (2010)Non-homologous end joining plays a key role in transgene concatemer formation in transgenic zebrafish embryos. International journal of biological sciences 6, 756-768. Davies, P.L., Fletcher, G.L.,Hew, C.L. (1989)Fish antifreeze protein genes and their use in transgenic studies. Oxford surveys on eukaryotic genes6,85-109. Devlin, R.H., Biagi, C.A, Yesaki, T.Y, Smailus, D.E.,Byatt, J.C. (2001)Growth of domesticated transgenic fish. Nature 409,781-782. Devlin, R.H., D'andrade, M., Uh, M.,Biagi, C.A. (2004)Population effects of growth hormone transgenic coho salmon depend on food availability and genotype by environment interactions. Proceedings of the National Academy of Sciences of the United States of America101, 9303-9308. Devlin, R.H., Sundstrom, L.F.,Muir, W.M. (2006)Interface of biotechnology and ecology for environmental risk assessments of transgenic fish. Trends in biotechnology 24,89-97. Dong, Z., Ge, J., Li, K., Xu, Z., Liang, D. (2011)Heritable targeted inactivation of myostatin gene in yellow catfish (Pelteobagrusfulvidraco) using engineered zinc finger nucleases. PloS one6, e28897. Doyon, Y., Mccammon, J.M., Miller, J.C., Faraji, F., Ngo, C. (2008)Heritable targeted gene disruption in zebrafish using designed zinc-finger nucleases. Nature biotechnology 26,702-708. Du, S.J., Gong, Z.Y., Fletcher, G.L., Shears, M.A., King, M.J. (1992)Growth enhancement in transgenic Atlantic salmon by the use of an "all fish" chimeric growth hormone gene construct. Bio/technology 10, 176-181. Duan, M., Zhang, T., Hu, W., Sundstrom, L.F., Wang, Y. (2009)Elevated ability to compete for limited food resources by 'all-fish' growth hormone transgenic common carp Cyprinuscarpio. Journal of fish biology 75, 1459-1472. Dunham, R.A. (2009)Transgenic fish resistant to infectious diseases, their risk and prevention of escape into the environment and future candidate genes for disease transgene manipulation. Comparative immunology, microbiology and infectious diseases32, 139-161. Dunham, R.A., Ramboux, A.C., Duncan, P.L., Hayat, M., Chen, T.T. (1992) Transfer, expression, and inheritance of salmonid growth hormone genes in channel catfish, Ictaluruspunctatus, and effects on performance traits. Molecular marine biology and biotechnology1, 380-389. Fu, C., Hu, W., Wang, Y.m.,Zhu, Z. (2005)Developments in transgenic fish in the People's Republic of China. Revue scientifiqueet technique 24, 299-307. Fujimura, K.,Kocher, T.D. (2011)Tol2-mediated transgenesis in tilapia (Oreochromisniloticus). Aquaculture319, 342-346. Gaj, T., Gersbach, C.A.,Barbas, C.F. (2013) ZFN, TALEN, and CRISPR/Cas-based methods for genome engineering.Trends in biotechnology31, 397-405. Gibbs, P.D.,Schmale, M.C. (2000)GFP as a Genetic Marker Scorable Throughout the Life Cycle of Transgenic Zebra Fish. Marine biotechnology2,107-125. Gill, J.A., Lowe, L., Nguyen, J., Liu, P.P., Blake, T. (2010) Enforced expression of Simian virus 40 large T-antigen leads to testicular germ celltumors in zebrafish. Zebrafish7, 333-341. Gong, Z.,Hew, C.L. (1995)Transgenic fish in aquaculture and developmental biology. Current Topics in Developmental Biology30, 177-214. Gong, Z., Ju, B., Wan, H. (2001)Green fluorescent protein (GFP) transgenic fish and their applications.Genetica111, 213-225. Gong, Z., Wan, H., Tay, T.L., Wang, H., Chen, M. (2003) Development of transgenic fish for ornamental and bioreactor by strong expression of fluorescent proteins in the skeletal muscle.Biochemical and biophysical research communications 308, 58-63. Guan, B., Ma, H., Wang, Y., Hu, Y., Lin, Z., Zhu, Z., Hu, W. (2011) Vitreoscillahemoglobin (VHb) overexpression increases hypoxia tolerance in zebrafish (Daniorerio). Marine biotechnology13; 336-344. Guo, L., Li, L., Zhang, S.,Zhang, G. (2012)Molecular cloning and characterization of the myostatin gene in a cultivated variety of bay scallop, Argopectenirradians. Aquaculture, 192-199. Hall, C., Flores, M.V., Storm, T., Crosier, K., Crosier, P. (2007)Thezebrafish lysozyme C promoter drives myeloid-specific expression in transgenic fish. BMC developmental biology 7, 42. Halloran, M.C., Sato-Maeda, M., Warren, J.T., Su, F., Lele, Z. et al. (2000)Laser-induced gene expression in specific cells of transgenic zebrafish. Development 127, 1953-1960. Her, G.M., Chiang, C.C., Wu, J.L. (2004)Zebrafish intestinal fatty acid binding protein (I-FABP) gene promoter drives gut-specific expression in stable transgenic fish. Genesis 38, 26-31. Hew, C.L., Davies, P.L., Fletcher, G. (1992) Antifreeze protein gene transfer in Atlantic salmon. Molecular marine biology and biotechnology 1; 309-317. Hockemeyer, D., Soldner, F., Beard, C., Gao, Q., Mitalipova, M. (2009) Efficient targeting of expressed and silent genes in human ESCs and iPSCs using zinc-finger nucleases. Nature biotechnology27, 851-857. Hostetler, H.A., Peck, S.L., Muir, W.M. (2003) High efficiency production of germ-line transgenic Japanese medaka (Oryziaslatipes) by electroporation with direct current-shifted radio frequency pulses. Transgenic research 12,413-24. Howard, R.D., Dewoody, J.A., Muir, W.M. (2004)Transgenic male mating advantage provides opportunity for Trojan gene effect in a fish. Proceedings of the National Academy of Sciences of the United States of America 101, 2934-2938. Hrytsenko, O., Pohajdak, B.,Wright, J.R.Jr. (2010)Production of transgenic tilapia homozygous for a humanized insulin gene. Transgenic research 19, 305-306. Hsieh, J.C, Pan, C.Y., Chen, J.Y. (2010) Tilapia hepcidin (TH)2-3 as a transgene in transgenic fish enhances resistance to Vibrio vulnificus infection and causes variations in immune-related genes after infection by different bacterial species. Fish & shellfish immunology29,430-439. Hu, S., Ni, W., Sai, W., Zi, H., Qiao, J. (2013)Knockdown of myostatin expression by RNAi enhances muscle growth in transgenic sheep. PloS one8, e58521. Hu, W., Wang, Y.,Zhu, Z. (2007)Progress in the evaluation of transgenic fish for possible ecological risk and its containment strategies. Science in China Series C, Life sciences / Chinese Academy of Sciences 50,573-579. Hu, W., Yu, D.H., Wang, Y.P., Wu, K.C., Zhu, Z.Y (2000)[Electroporation of sperm to introduce foreign DNA into the genome of Pinctada maxima (Jameson)]. Sheng wu gong chengxuebao= Chinese journal of biotechnology 16,165-168. Hu, W.,Zhu, Z. (2010)Integration mechanisms of transgenes and population fitness of GH transgenic fish.Science China Life sciences 53, 401-408. Hu, X., Guo, H., He, Y., Wang, S., Zhang, L. (2010)Molecular characterization of Myostatin gene from Zhikong scallop Chlamysfarreri (Jones et Preston 1904). Genes and genetic systems 85,207-218. Inoue, K., Ozato, K., Kondoh, H., Iwamatsu, T., Wakamatsu, Y. (1989)Stage-dependent expression of the chicken delta-crystallin gene in transgenic fish embryos. Cell differentiation and development : the official journal of the International Society of Developmental Biologists 27, 57-68. Inoue, K., Yamashita, S., Hata, J., Kabeno, S., Asada, S. (1990) Electroporation as a new technique for producing transgenic fish. Cell differentiation and development: the official journal of the International Society of Developmental Biologists 29,123-8. Ivics, Z., Li, M.A., Mates, L., Boeke, J.D., Nagy, A. (2009)Transposon-mediated genome manipulation in vertebrates. Nature methods6, 415-422. Iwai, T., Inoue, S., Kotani, T., Yamashita, M. (2009) Production of transgenic medaka fish carrying fluorescent nuclei and chromosomes. Zoological science26,9-16. Ju, B., Chong, S.W., He, J., Wang, X., Xu, Y. et al. (2003)Recapitulation of fast skeletal muscle development in zebrafish by transgenic expression of GFP under the mylz2 promoter. Developmental Dynamics227,14-26. Kapuscinski, A.R. (2005) Current scientific understanding of the environmental biosafety of transgenic fish and shellfish. Revue scientifiqueet technique 24,309-322. Kawakami, K. (2007) Tol2: a versatile gene transfer vector in vertebrates. Genome biology 8, S7. Kerr, T.,Roalson, E.H., Rodgers, B.D. (2005) Phylogenetic analysis of the myostatin gene sub-family and the differential expression of a novel member in zebrafish.Evolution and development7, 390-400. Kim, J.H., Balfry, S., Devlin, R.H. (2013) Disease resistance and health parameters of growth-hormone transgenic and wild-type coho salmon, Oncorhynchuskisutch.Fish andshellfish immunology34,1553-1559. Kinoshita, M., Tanaka, M.,Yamashita, M. (2000)Development of transgenic fish strain and promoter analysis. Tanpakushitsukakusankoso Protein, nucleic acid, enzyme 45, 2954-2961. Knight, J. (2003) GloFish casts light on murky policing of transgenic animals. Nature426, 1-372. Kocabas, A.M., Kucuktas, H., Dunham, R.A., Liu, Z. (2002)Molecular characterization and differential expression of the myostatin gene in channel catfish (Ictaluruspunctatus). Biochimicaetbiophysicaacta1575, 99-107. Koga, A., Suzuki, M., Inagaki, H., Bessho, Y.,Hori, H. (1996)Transposable element in fish.Nature 383, 1- 30. Krasnov, A., Agren, J.J., Pitaknen, T.I.,Molsa, H. (1999)Transfer of growth hormone (GH) transgenes into Arctic charr. (Salvelinusalpinus L.) II. Nutrient partitioning in rapidly growing fish. Genetic analysis :biomolecular engineering15, 99-105. Langenau, D.M., Traver, D., Ferrando, A.A., Kutok, J.L., Aster, J.C. et al. (2003)Myc-induced T cell leukemia in transgenic zebrafish. Science 299,887-90. Lee, O., Green, J.M.,Tyler, C.R. (2015)Transgenic fish systems and their application in ecotoxicology. Critical reviews in toxicology45, 124-141. Levesque, H.M., Shears, M.A., Fletcher, G.L.,Moon, T.W. (2008)Myogenesis and muscle metabolism in juvenile Atlantic salmon (Salmosalar) made transgenic for growth hormone. The Journal of experimental biology211, 128-137. Li, D., Hu, W., Wang, Y., Zhu, Z.,Fu, C. (2009)Reduced swimming abilities in fast-growing transgenic common carp Cyprinuscarpio associated with their morphological variations. Journal of fish biology74, 186-97. Lian, H., Hu, W., Huang, R., Du, F., Liao, L. et al. (2013)Transgenic common carp do not have the ability to expand populations. PloS one8, e65506. Lin, C.H., John, J.A., Ou, L.W., Chen, J.C., Lin, C.H. et al. (2004)Cloning and characterization of metallothionein gene in ayuPlecoglossusaltivelis. Aquatic toxicology 66, 111-124. Liu, T., Liu, L., Wei, Q., Hong, Y. (2011) Sperm nuclear transfer and transgenic production in the fish medaka.International journal of biological sciences 7, 469-475. Liu, W.Y., Wang, Y., Qin, Y., Wang, Y.P.,Zhu, Z.Y. (2007)Site-directed gene integration in transgenic zebrafish mediated by crerecombinase using a combination of mutant lox sites. Marine biotechnology9,420-428. Liu, Z.J., Moav, B., Faras, A.J., Guise, K.S., Kapuscinski, A.R. (1990) Development of expression vectors for transgenic fish. Bio/technology8,1268-1272. Lohmus, M., Bjorklund, M., Sundstrom, L.F., Devlin, R.H. (2010) Effects of temperature and growth hormone on individual growth trajectories of wild-type and transgenic coho salmon Oncorhynchuskisutch.Journal of fish biology76,641-654. Lohmus, M., Raven, P.A., Sundstrom, L.F.,Devlin, R.H. (2008)Disruption of seasonality in growth hormone-transgenic coho salmon (Oncorhynchuskisutch) and the role of cholecystokinin in seasonal feeding behavior. Hormones and behavior54,506-513. Maclea, K.S.,Abuhagr, A.M., Pitts, N.L., Covi, J.A., Bader, B.D. et al. (2012)Rheb, an activator of target of rapamycin, in the blackback land crab, Gecarcinuslateralis: cloning and effects of molting and unweighting on expression in skeletal muscle. The Journal of experimental biology215, 590-604. Maclean, N., Iyengar, A., Rahman, A.,Sulaiman, Z.,Penman, D. (1992)Transgene transmission and expression in rainbow trout and tilapia. Molecular marine biology and biotechnology 1, 355-365. Mali, P., Yang, L., Esvelt, K.M., Aach, J., Guell, M. et al. (2013)RNA-guided human genome engineering via Cas9. Science 339, 823-826. Mao, H., Wang, D.H., Yang, W.X. (2012)The involvement of metallothionein in the development of aquatic invertebrate. Aquatic toxicology 110,208-213. Marris, E. (2010) Transgenic fish go large. Nature467, 259. Martinez, R., Juncal, J., Zaldivar, C., Arenal, A., Guillen, I. (2000)Growth efficiency in transgenic tilapia (Oreochromis sp.) carrying a single copy of an homologous cDNA growth hormone. Biochemical and biophysical research communications267, 466-472. Meyer, B.M., Froehlich, J.M., Galt, N.J.,Biga, P.R. (2013)Inbred strains of zebrafish exhibit variation in growth performance and myostatin expression following fasting. Comparative biochemistry and physiology Part A, Molecular and integrative physiology 164,1-9. Miller, J.C., Holmes, M.C., Wang, J., Guschin, D.Y., Lee, Y.L. et al. (2007)An improved zinc-finger nuclease architecture for highly specific genome editing. Nature biotechnology25, 778-785. Mohanta, R., Jayasankar, P., Das Mahapatra, K., Saha, J.N.,Barman, H.K. (2014)Molecular cloning, characterization and functional assessment of the myosin light polypeptide chain 2 (mylz2) promoter of farmed carp, Labeorohita. Transgenic research23, 601-607. Moreau, D.T., Conway, C.,Fleming, I.A. (2011)Reproductive performance of alternative male phenotypes of growth hormone transgenic Atlantic salmon (Salmosalar). Evolutionary applications 4, 736-748. Moreau, D.T., Gamperl, A.K., Fletcher, G.L.,Fleming, I.A. (2014)Delayed phenotypic expression of growth hormone transgenesis during early ontogeny in Atlantic salmon (Salmosalar) PloS one 9,e95853. Mosher, D.S., Quignon, P., Bustamante, C.D., Sutter, N.B., Mellersh, C.S. (2007)A mutation in the myostatin gene increases muscle mass and enhances racing performance in heterozygote dogs. PLoS genetics3, e79. Muir, W.M., Howard, R.D. (2002) Assessment of possible ecological risks and hazards of transgenic fish with implications for other sexually reproducing organisms.Transgenic research11, 101-114. Murakami, Y, Motohashi, K, Yano, K, Ikebukuro, K, Yokoyama, K, Tamiya, EKarube, I (1994)Micromachined electroporation system for transgenic fish. Journal of biotechnology 34, 35-42. Nadjar-Boger, E., Hinits, Y.,Funkenstein, B. (2012) Structural and functional analysis of myostatin-2 promoter alleles from the marine fish Sparusaurata: evidence for strong muscle-specific promoter activity and post-transcriptional regulation. Molecular and cellular endocrinology 361,51-68. Nam, Y.K., Cho, Y.S.,Kim, D.S. (2000)Isogenic transgenic homozygous fish induced by artificial parthenogenesis. Transgenic research9, 463-9. Nam, Y.K., Noh, J.K., Cho, Y.S., Cho, H.J., Cho, K.N. (2001)Dramatically accelerated growth and extraordinary gigantism of transgenic mud loach Misgurnusmizolepis. Transgenic research 10, 353-362. Overturf, K. (2009) Molecular research in aquaculture, Ames, Iowa: Wiley-Blackwell. Ozato, K., Kondoh, H., Inohara, H., Iwamatsu, T., Wakamatsu, Y. et al. (1986)Production of transgenic fish: introduction and expression of chicken delta-crystallin gene in medaka embryos.Cell differentiation19, 237-244. Pai, R., Soreghan, B., Szabo, I.L., Pavelka, M., Baatar, D. (2002)Prostaglandin E2 transactivates EGF receptor: a novel mechanism for promoting colon cancer growth and gastrointestinal hypertrophy. Nature medicine8; 289-293. Pan, X., Zhan, H.,Gong, Z. (2008)Ornamental expression of red fluorescent protein in transgenic founders of white skirt tetra (Gymnocorymbusternetzi).Marine Biotechnology (New York)10, 497-501. Phelps, M.P., Jaffe, I.M.,Bradley, T.M. (2013)Muscle growth in teleost fish is regulated by factors utilizing the activin II B receptor. The Journal of experimental biology 216, 3742-3750. Pie, M.R.,Alvares, L.E. (2006)Evolution of myostatin in vertebrates: is there evidence for positive selection? Molecular phylogenetics and evolution41, 730-734. Powers, D.A., Gonzalez-Villasenor, L.I., Zhang, P.J., Chen, T.T.,Dunham, R.A. (1991)Studies on transgenic fish: gene transfer, expression, and inheritance. Biotechnology16, 307-324. Rahman, M.A., Mak, R., Ayad, H., Smith, A.,Maclean, N. (1998)Expression of a novel piscine growth hormone gene results in growth enhancement in transgenic tilapia (Oreochromisniloticus). Transgenic research 7, 357-369. Rajesh, R.,Majumdar, K.C. (2005)Transgene integration - an analysis in autotransgenicLabeorohita Hamilton (Pisces: Cyprinidae). Fish physiology and biochemistry 31,281-287. Rajesh, R.,Majumdar, K.C. (2008)The growth hormone-encoding gene isolated and characterized from Labeorohita Hamilton is expressed in CHO cells under the control of constitutive promoters in 'autotransgene' constructs. Fish physiology and biochemistry 34, 413-436. Ramseyer, L.J. (2002) Transgenic fish: a boon or threat? Science 298, 1715. Rao, N.M., Rambabu, K.M.,Rao, S.H. (2008)Electroporation of adult zebrafish.Methods in molecular biology 423, 289-298. Raven, P.A., Sakhrani, D., Beckman, B., Neregard, L., Sundstrom, L.F. (2012) Growth and endocrine effects of recombinant bovine growth hormone treatment in non-transgenic and growth hormone transgenic coho salmon. General and comparative endocrinology 177, 143-152. Rembold, M., Lahiri, K., Foulkes, N.S.,Wittbrodt, J. (2006)Transgenesis in fish: efficient selection of transgenic fish by co-injection with a fluorescent reporter construct. Nature protocols1, 1133-1139. Ren, H., Xu, M., He, P., Muto, N., Itoh, N. et al. (2006)Cloning of crucian carp (Carassiuscuvieri) metallothionein-II gene and characterization of its gene promoter region.Biochemical and biophysical research communications 342,1297-304. Rosen, J.N., Sweeney, M.F.,Mably, J.D. (2009)Microinjection of zebrafish embryos to analyze gene function. Journal of visualized experiments :JoVE. Sanematsu, F., Takami, Y., Barman, H.K., Fukagawa, T., Ono, T.(2006)Asf1 is required for viability and chromatin assembly during DNA replication in vertebrate cells. The Journal of biological chemistry, 281, 13817-13827. Sanjana, N.E., Cong, L., Zhou, Y., Cunniff, M.M., Feng, G. (2012) A transcription activator-like effector toolbox for genome engineering. Nature protocols7, 171-192. Sarmasik, A., Chun, C.Z., Jang, I.K., Lu, J.K.,Chen, T.T. (2001a)Production of transgenic live-bearing fish and crustaceans with replication-defective pantropic retroviral vectors. Marine biotechnology 3, S177-S184. Sarmasik, A., Jang, I.K., Chun, C.Z., Lu, J.K.,Chen, T.T. (2001b)Transgenic live-bearing fish and crustaceans produced by transforming immature gonads with replication-defective pantropic retroviral vectors. Marine biotechnology3, 470-477. Shimizu, A., Shimizu, N. (2013) Dual promoter expression system with insulator ensures a stringent tissue-specific regulation of two reporter genes in the transgenic fish. Transgenic research 22, 435-444. Sin, F.Y., Walker, S.P., Symonds, J.E., Mukherjee, U.K., Khoo, J.G. et al. (2000)Electroporation of salmon sperm for gene transfer: efficiency, reliability, and fate of transgene. Molecular reproduction and development56, 285-288. Stinckens, A., Luyten, T.,Bijttebier, J., Van Den Maagdenberg, K., Dieltiens, D. et al. (2008)Characterization of the complete porcine MSTN gene and expression levels in pig breeds differing in muscularity. Animal genetics 39, 586-596. Stokstad, E. (2002) Transgenic species. Engineered fish: friend or foe of the environment? Science, 297,1797-1799. Su, B., Shang, M., Li, C., Perera, D.A., Pinkert, C.A. (2015)Effects of transgenic sterilization constructs and their repressor compounds on hatch, developmental rate and early survival of electroporated channel catfish embryos and fry. Transgenic research24, 333-352. Sundstrom, L.F., Lohmus, M.,Devlin, R.H. (2005)Selection on increased intrinsic growth rates in coho salmon, Oncorhynchuskisutch. Evolution; international journal of organic evolution 59, 1560-1569. Sundstrom, L.F., Lohmus, M.,Devlin, R.H. (2010)Migration and growth potential of Coho salmon smolts: implications for ecological impacts from growth-enhanced fish. Ecological applications: a publication of the Ecological Society of America 20, 1372-1383. Sundstrom, L.F., Lohmus, M., Johnsson, J.I.,Devlin, R.H. (2004)Growth hormone transgenic salmon pay for growth potential with increased predation mortality. Proceedings Biological sciences / The Royal Society271, S350-S352. Thayanithy, V., Anathy, V., Kirankumar, S.,Pandian, T.J. (2004)Growth enhancement and food conversion efficiency of transgenic fish Labeorohita. Journal of experimental zoology Part A, Comparative experimental biology 301,477-90. Venugopal, T., Mathavan, S.,Pandian, T.J. (2002)Molecular cloning of growth hormone encoding cDNA of Indian major carps by a modified rapid amplification of cDNA ends strategy. Journal of biosciences27, 261-272. Vick, B.M., Pollak, A., Welsh, C.,Liang, J.O. (2012)Learning the scientific method using GloFish. Zebrafish9, 226-241. Warmbrodt, R.D., Stone, V. (1993) National Agricultural Library (U.S.)Transgenic fish research: a bibliography: a selected bibliography of research in the field of molecular biology and genetic engineering using fresh water fish, Beltsville, Md. : National Agricultural Library. Weaver, D. (2002) Dealing with the risks of transgenic fish. Science 298, 1715. Wu, B., Sun, Y.H., Wang, Y.P., Wang, Y.W.,Zhu, Z.Y. (2004)Sequences of transgene insertion sites in transgenic F4 common carp. Transgenic research13, 95-96. Wu, B., Sun, Y.H. Wang, Y.W., Wang, Y.P., Zhu, Z.Y. (2005)Characterization of transgene integration pattern in F4 hGH-transgenic common carp (Cyprinuscarpio L.). Cell research15, 447-454. Wu, B.,Zhu, Z.Y. (2003)[Integration sites of transgenes in transgenic animals]. Yi chuan = Hereditas / Zhongguoyichuanxuehuibianji25, 77-80. Xu, J., Huang, W., Zhong, C., Luo, D., Li, S. (2011)Defining global gene expression changes of the hypothalamic-pituitary-gonadal axis in female sGnRH-antisense transgenic common carp (Cyprinuscarpio). PloS one 6,e21057. Xu, Q., Feng, C.Y., Hori, T.S., louffe, D.A., Buchanan, J.T. (2013)Family-specific differences in growth rate and hepatic gene expression in juvenile triploid growth hormone (GH) transgenic Atlantic salmon (Salmosalar). Comparative biochemistry and physiology Part D, Genomics and proteomics 8, 317-333. Xu, Q., Stemple, D.,Joubin, K. (2008)Microinjection and cell transplantation in zebrafish embryos.Methods in molecular biology461,513-520. Yazawa, R., Hirono, I., Aoki, T. (2005)Characterization of promoter activities of four different Japanese flounder promoters in transgenic zebrafish. Marine Biotechnology (New York) 7, 625-633. Ye, X., Tian, Y.Y.,Gao, F.Y. 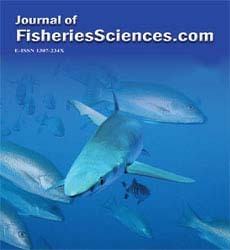 (2011)[Progress in transgenic fish techniques and application]. Yi chuan = Hereditas / Zhongguoyichuanxuehuibianji33, 494-503. Zbikowska, H.M. (2003) Fish can be first--advances in fish transgenesis for commercial applications. Transgenic research12,379-89. Zeng, Z., Liu, X., Seebah, S.,Gong, Z. (2005a)Faithful expression of living color reporter genes in transgenic medaka under two tissue-specific zebrafish promoters. Developmental Dynamics234,387-392. Zeng, Z., Shan, T., Tong, Y., Lam, S.H., Gong, Z. (2005b) Development of estrogen-responsive transgenic medaka for environmental monitoring of endocrine disrupters.Environmental science andtechnology39, 9001-9008. Zhang, P.J., Hayat, M., Joyce, C., Gonzalez-Villasenor, L.I., Lin, C.M. (1990)Gene transfer, expression and inheritance of pRSV-rainbow trout-GH cDNA in the common carp, Cyprinuscarpio (Linnaeus). Molecular reproduction and development25, 3-13. Zhang, X.,Yang, X. (2004)[Safety evaluation of food from transgenic fish and the molecular biological mechanism]. Wei sheng yanjiu = Journal of hygiene research33, 233-236. Zhong, C., Song, Y., Wang, Y., Zhang, T., Duan, M. (2013)Increased food intake in growth hormone-transgenic common carp (Cyprinuscarpio L.) may be mediated by upregulating Agouti-related protein (AgRP). General and comparative endocrinology 192, 81-88. Zhong, Q.W.,Fan, T.J. (2002)Advances in fish antifreeze protein research. Sheng wuhuaxueyu sheng wuwu li xuebaoActabiochimicaetbiophysicaSinica34, 124-130. Zhu, Z., He, L.,Chen, S. (1985)Novel gene transfer into the fertilized eggs of gold fish (Carassiusauratus L. 1758).Journal of Applied Ichthyology 1, 31-34. Zimmers, T.A., Davies, M.V., Koniaris, L.G., Haynes, P., Esquela, A.F. (2002)Induction of cachexia in mice by systemically administered myostatin. Science296, 1486-1488.